Recently Google Partners Connect presented on the latest video ad tips and strategies with the intention of helping businesses get the most out of their advertising budget. Google is also proud to partner with digital marketing agencies, like Proceed Innovative, around the country to help set up and manage video marketing campaigns for businesses that may not have the time or resources to do it themselves. As a proud Google Partner, Proceed Innovative has years of experience in the field of digital marketing, specifically with search engine optimization (SEO), paid advertising (AdWords), and web design. When working with us, we will not only create an optimized campaign but implement a number of strategies over time to deliver qualified results. If you have any questions regarding the Google presentation, please don’t hesitate to reach out to our digital marketing experts for help! The presentation began with speaker Bart, a regional product specialist, who discussed how video plays into today’s consumer journey. He also demonstrated how businesses can take advantage of YouTube, the video search engine giant, to drive performance from their video ads. Bart begins his presentation by stating that video is the most powerful story-telling platform used for advertising today, using sight, sound, and motion. He explains that search captures people, but video moves people. Bart continues that Google is also optimizing their search results to feature videos on YouTube in order to drive consumers to take action; the customers who are using Google Search are also using YouTube. Therefore, even a strong Search campaign can miss the opportunity to convert website visitors because the site may not have a video. So here’s the challenge: How can you use YouTube to tell your story and drive performance and results? Now that YouTube has the viewership to find new customers at scale, around 1.5 billion users are watching at least 1 hour of video on their mobile device each month. But YouTube’s goal is not to reach everyone, rather, the right people. So how do they do this? YouTube uses precision to target high-intent audiences, or people with the intent to purchase. They do this by combining vast amounts of data from users with machine learning to reach the right audiences at the right time. Bart refers to this data as signals, talking about how Google is leveraging them to both existing and future targeting functionalities. So if users are searching for specific offers, such as seasonal offers or stores nearby, this data, or signals, are incorporated into existing and new targeting methods. Google then announced that businesses are now able to target users that are watching videos on YouTube after searching specific keywords on Google. So in order to take advantage of this opportunity, you can add the keywords from your AdWords Search campaign to reach this audience on YouTube. Google also explained that it is best create one campaign for each type of targeting. This will allow for the easiest, most efficient optimization process. You will also be able to control your budget in each campaign, whereas in one, your budget may not be spent the way you planned. 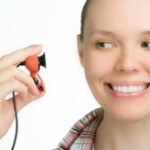 How to Leverage Targeting to Reach People by Action, Intent, and Interest. Depending on how you want to reach your users, Google recommends the options listed above based on the type of targeting. Re-engage existing users: Use Remarketing and Customer Match for users who did not previously convert on your website or reconnect with users who searched for your product or service using Custom Intent Audiences. Expand to new users: Use Similar Audiences to expand on your existing customer base or drive demand further by using Strategy 2. Drive Demand: User upper funnel targeting (Age, Gender, Affinity, etc.) to fill remarketing lists with engaged users or optimize segments that perform best for conversions while excluding poor performers. While it sounds complicated and like a lot of work, the results will pay off. Here are some examples of the results achieved by Sonos, Betterment, and Purple Mattress after implementing these targeting strategies. Scale and precision: reaching individuals at scale as well as reaching audiences that have the highest likelihood of converting. Innovations: Google has innovated itself in order to reach individuals on cross-devices, incorporating signals from Google Search, Google Maps, YouTube, and more. Use new targeting capabilities: Leverage Custom Intent Audiences to reach audiences at the right place and time. Best practices: Google showed how to set up and manage Custom Intent Audiences using proven strategies to get the most out of the campaign. The Google presentation continues with a new speaker, Ryan, a global product lead who works on video ads. Learn how video advertisers can work together to drive increased performance using YouTube’s new ad formats. Ryan begins his presentation by explaining how video advertisers can win the attention of users in a high competitive mobile world. Only 66% of (YouTube) video ads are at least 50% on screen for at least 2 seconds. Only 45% of TV commercial time is actually watched due to skipping, multitasking, and channel switching. Ultimately, Google isn’t recommending advertisers to move away from TV commercial advertising, just to point that attention is scarce with any ad formats. On the other hand, Google explains that YouTube ads are full sight and sound pitches for a business to a viewer who is interested in watching. They also said that 95% of YouTube ads play in-view and with sound on. In turn, this has proven to drive 2.6x stronger, more efficient results. When Ryan discusses how to drive video watching into action, he spoke in terms of driving clicks and conversions. This can be done through YouTube’s new ad format, called TrueView for Action, that integrates call-to-action buttons within the ad while its playing. The intent of this ad format is to allow the user to take action right after watching the ad, such as getting a quote, buying now, or learning more. 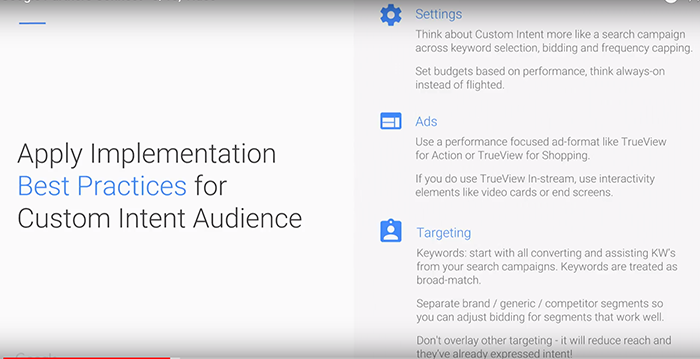 To implement the new video ad format onto the new AdWords interface, the campaign admin must first select the “Video” tab and then “Leads” as the marketing goal. Although the option is not available on all campaigns just yet; some advertisers will have to wait until it is available. Target CPA with automated bidding is a new feature on AdWords that allows businesses to set a bid and lets machine learning find high-intent users to convert at the desired CPA. Here’s the advantage: No more manual optimization and more control to scale campaigns to targeted performance objectives. 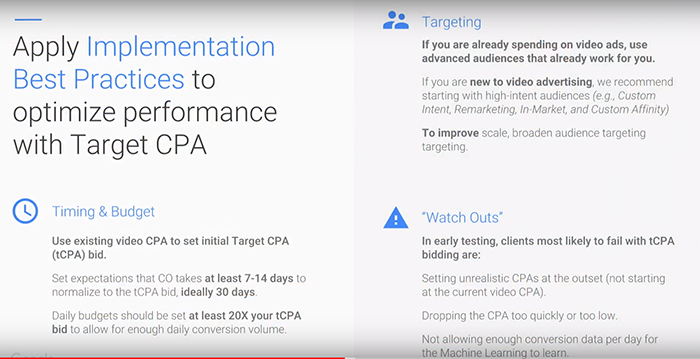 Google then provided some best practices when optimizing the video ads performance with Target CPA. Google announced that they are now accurately able to measure each conversion and click on cross-devices from YouTube video campaigns. But when measuring conversions, it is important to see which clicks and impressions of the video ads contributed to each conversion and vice versa. 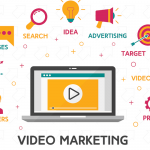 So here’s how to include both conversions and view-through conversions in the video ad campaign. Google does not include them both by default. You will also want to consider how conversions from the video ad are tracked in AdWords. If YouTube is set up in the same CID as non-video campaigns, AdWords will NOT count YouTube’s conversions. All of the credit will be given to the last click ad interaction. So if a customer watches a YouTube ad, then conducts a search on Google, the conversion is only counted towards the Search campaign because of the Last-Click attribution model. Acknowledging that YouTube is being slightly undervalued if all of the campaigns run under the same account across YouTube Search and Display. Measuring YouTube in a separate account to see every conversion path where YouTube was present. You can also track micro-conversions to track YouTube’s full funnel impact. Micro-conversions are conversions that occur slightly further up the funnel, have a shorter time to conversion, and are expected to come in larger numbers. You will want to use every measurable conversion feature in order to gain the most insights and understanding from the performance of your campaign. Google also rolled out another feature that pairs well with Location Extensions for TrueView Ads: store visits tracking. Store tracking allows businesses to know how many people watched a YouTube video and visited a store afterwards. While this solution isn’t applicable for all businesses, it allows small stores and companies with many locations to track store visits from their YouTube ads. New YouTube products now allow companies to reach customers based on intent, win their attention in a low-attention Mobile world, and drive measurable action. All tools discussed throughout the presentation are either already launched or will be launched in the near future. All businesses have the opportunity to work with a Google Partner, marketing agencies like Proceed Innovative that follow Google’s best practices and are AdWords certified. It’s amazing what Google has rolled out these past few years. Not only is it tracking customer behavior, but the search engine giant is responding with the launch of new targeting strategies and video ad formats. With these new tools and techniques, businesses are better able to improve ROI while providing convenience and customized services to customers. On the other hand, the sales will only come if these tools and strategies are implemented properly. A company must be in the right place at the right time in order to convert the customer. This is where a Google Partner like Proceed Innovative can provide some assistance. Our digital marketing experts have years of experience when it comes to helping companies increase their ROI. Our focus is to stay updated on the latest internet marketing tools and trends, including driving performance and results with video ads on YouTube. With innovation, determination, and experience, we have not only been able to deliver results but measure them in order to improve the presence of businesses online. To learn more about how we can help you grow your business online, give us a call at (800) 933-2402 or fill out a contact form to the right. We look forward to hearing from you!